THE SKINNY: This is a great neutral palette that is perfect for everyday wear. Too Faced Natural Eyes Palette includes nine great shades -- some more matte, some with more shimmer -- the go great with almost anything. The colors are deep and rich and long wearing. With a little primer, the color held all day long. This palette by Too Faced is comparable to Urban Decay's Naked line ... and works almost as well. I really enjoyed the included "Glamour Guide" to help create specific looks using the palette. Seriously though, can you ever have enough great browns? 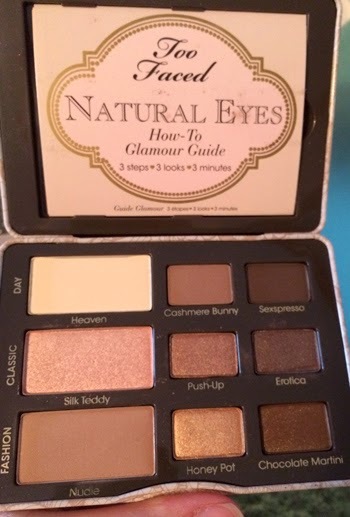 CHECK IT OUT: Too Faced Natural Eyes Palette came in a recent Pop Sugar Must Have box (worth more than the cost of the box alone). I highly recommend this monthly box. Try it now!